as if the sun's setting. Since we start all new classes in January, I have had a series of "last classes" with various cohorts of students. As a kind of tradition, I typically buy them pizza and we have a little party. I had quite a number of these over the last several days. A few classes where they wanted to, we played some games, too. Anyway, I will be sad about the students I won't likely see again (because they're moving up to 9th grade, where I no longer teach). The Pizza Days have ended. Monday is all-new classes. A lot of work, but for now, I will do nothing until next year. of dusk, flavored by the moon. I consider myself an advocate of evidence-based medicine. Generally, I have little patience for people who advocate for unproven medical approaches (or worse, "alternative medicines" that have been specifically proven in repeated studies to be useless). I am a regular reader of science-based medicine blogs such as the excellent (if often monotonous and occasionally strident) sciencebasedmedicine.org. In my role as cancer survivor, I would say I have been subjected to a greater number of these kinds of advocacies than the average person, too. Nevertheless, any kind of advocacy - even the advocacy for evidence-based medicine - can be taken too far. The excessive push for the "gold-standard" - randomized controlled trials - in every type of health-focused intervention can certainly be carried too far. I ran across this excellent, short satire that appears, "played straight," at the British Medical Journal website. Here is a sampling. I like the bit about "trauma related to gravitational challenge." Addendum: Actually, before someone complains, I think I should clarify that I acknowledge at least a limited understanding that there is an important technical difference between the concepts of "science-based medicine" and "evidence-based medicine," and that, in fact, this satire is essentially a criticism of the latter from the perspective of the former. Caveat: How did I get here? "Teacher, can I use my phone now?" This is normally not encouraged during class. It was 9:30 - halfway through the last hour of class. "Can't this wait until after class ends?" I asked. "I need to call my mom," she explained. "Um... why do you need to call your mom?" Pause. "I have to tell to get a ride home." "I see. Well, I guess that's important," I acquiesced. A moment later, after fishing around her backpack, she said, "I can't find my phone. Can I use my iPad to send a text message?" I shrugged. "One way, or another. But can you get it done? So we can continue with class?" She fiddled with her iPad for a moment, then looked up. "Actually, uh... I just remembered, I rode my bike." "So you don't need to call your mom?" She nodded. It's worth noting that this girl, finishing up the 7th grade, is the absolute highest-scoring student at Karma, right now. And although she speaks with a noticeable Korean accent, in terms of grammar and vocabulary I'd give her the lead in a comparison with any US teenager. But she's a bit of an airhead. I saw this image, left, written up at Language Log blog. The Arabic product name is "Chinese Astrology." Which just adds more dissonance. I think if you can figure out how all the pieces in this image fit together, you will have solved the mysteries of the 21st century. try to discover what's good. Last Friday, my TQ phonics class merged with Grace's CS "post-phonics" class and had a caroling competition. These are 2nd and 3rd graders. Grace's class have been studying English for two years but the TQ kids (last group singing) have had less than a year of English, just a few hours a week. So I was proud of them. In cold wind, a few leaves swirled. here at the end of the world. This year, Christmas is on a Sunday. Since Christmas isn't a major holiday in Korea, that means that this year, there are no days off for Christmas. It's just a Sunday, and I get my typical 1.5 day weekend. I made some syllabuses (-bi?) this past week, for the new year. So I was busy. I will rest in a fairly unchristmassy way, and return to work on Monday. Electric Light Orchestra, "Turn To Stone." Yes, I'm turnin' to stone 'cos you ain't comin' home. Why you ain't comin' home if I'm turnin' to stone? yes, I'm turnin', I'm turnin', I'm turnin' to stone. Students quit and went away. and I can't think what to say. I like this student, but I understand my coworker's frustration too. He is almost unteachable, at least in a conventional sense. Stubborn and unmotivated, and somehow both smart but incapable of remembering what seem like elementary bits of information. The other day he asked me how to spell "Karma" - the name of our academy and something you'd expect a 2-years-plus student to have mastered. I suppose this anecdote doesn't have much of a deeper purpose, except just to share that I think teachers should be emotionally invested in their students, even if that makes for rough going sometimes. I have argued with Curt and others about this - sometimes I feel like he only wants robots teaching. I understand that view point - as a manager of an education business, he wants replicable and scalable results, not emotional individuals. Nevertheless, I think there can be ways to allow both. Through alleys and clouds they go! In the Christmas spirit, here's a modern interpretation of the 12 Days of Christmas. The 12 Days of Christmas - A Tale of Avian Misery from Blink on Vimeo. Speaking of (avian) misery, I thought I had gotten past the horrible flu that everyone was stricken with, but there seems to have been a second half. I'm sleeping a lot. Extra. across gulfs of feline mood. without fear." The other mewed. 6th grade student: Teacher, do you like beer? Student: I don't like beer. Teacher: Really? When do you drink beer? Student: When my dad gives me some. Teacher: But you don't like it? Teacher: So why do you drink it? Teacher: Maybe you should wait till you're older. Observation: I'm not sure how much I believe this student. He likes making up stories. But anyway, talking with him can be quite entertaining. pushing the earth, like a mole. And there I buried my brain. With rain, I might grow a soul. "My uncle has 200 cows. He thought he had 199 until he rounded them up." - from specgram.tumblr.com. where I knelt in spinning dust. Lately I've been struggling with motivation on personal projects of all kinds. So this blog is boringer than usual, I'm sure. I'll share this thing I ran across the other day. This Russian guy plays the Star Wars Imperial March using only a plastic coffee stirring stick. Try something. Open your head. Find some ghosts. Talk to the dead. come screaming through what they said. Thinking stuff, and it feels deep. But it's not - just wasting time. The climb out is very steep. 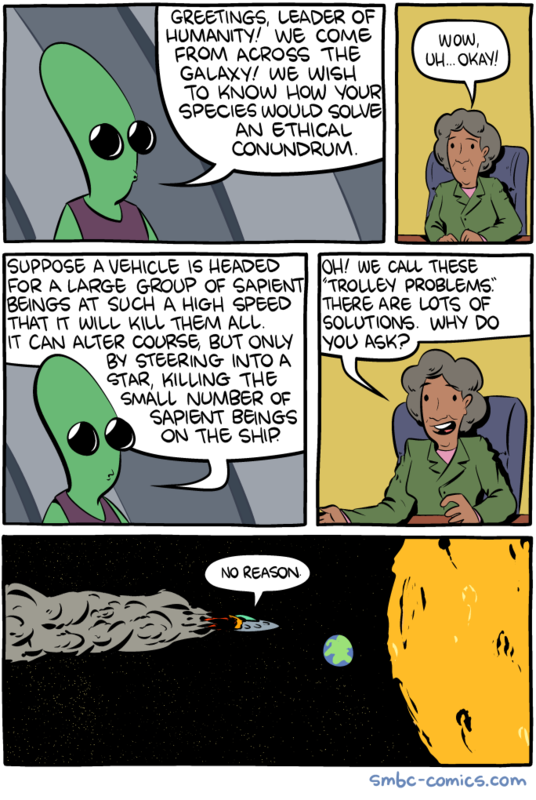 I have blogged before about trolley problems. They intrigue me. I ran across this humorous take. Let's see how this plays out. I wonder what the new Space Emperor would say, if he received this kind of call? The rhythms of hagwon life are pretty well understood by me, now. December is a tough month - it's the de facto end of the hagwon school year (the Korean school year officially ends at the end of February, but the hagwon business, getting a jump on things, seems to be driven to move the kids up a grade a few months in advance). So we have a kind of "open house," called 설명회, every year around this time. That means coming to work early, and for a foreigner peon such as myself (and don't get me wrong, I am a peon entirely by choice, at this point), it mostly means standing around trying to look competent while others make their presentations. So that's what happened, this morning. There's a lot of unsurprising end-of-year work to get done: new curricula being laid out (such as they are); level testing for the kids (such as it goes). Nevertheless, in the Korean way, which I find so amenable to my personal inclinations, I shall procrastinate. Therefore, just now I have some time to kill at work. Not enough time to go home and come back later for class, so just sitting here. I wish my mind was feeling more dynamic, these days, but it's not. Still coming off the nasty flu thing I had. It's a frigid day outside. I guess it's about -5° C - but bright and sunny. the winter wind tastes like slate. More useful work is being done on the internet, just in time for Christmas! Someone has helpfully translated Rudolf The Red-Nosed Reindeer into Anglo-Saxon. This was posted at the All Things Linguistic blog. unfold, like coils or springs. A clockwork beetle grows wings.